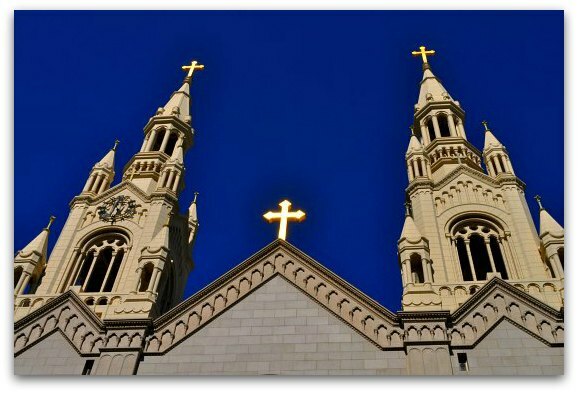 You will find a broad range of churches in San Francisco. They include everything from the historic Mission Dolores to the colorful Glide Memorial Church. Below you will discover frequently visited churches as well as those that are the top picks to attend a service. This Episcopalian cathedral is one of the largest in the US. It sits high on the hill in San Francisco's Nob Hill neighborhood. It's open for visitors daily before and after their regular services. If you are interested in attending a service, the most popular options are on Sunday morning at 8:30am and 11:30am. The Mission Dolores is the site of the oldest building still standing in San Francisco. They offer traditional Catholic masses in their Basilica. They typically offer English masses every Sunday morning at 8am and 10am. They also offer a Spanish mass at noon. After mass, I recommend visiting both the Old Mission, where you will find some amazing murals, and the cemetery. This is not your typical Methodist church. Glide is famous for its work with the homeless and less fortunate of San Francisco. Their services are non-traditional with stories from those they have helped along with other uplifting messages and music (their chorus is one of the best I've ever heard). Each service is PACKED (usually the second service has a line around the block before the first service is done) and it's a favorite of locals. They offer two Sunday services - one at 9am and one at 11am. Get there early (minimum of 30 minutes before the service) in order to grab a seat. Saint Peter and Paul's Catholic Church is another popular stop for those looking to attend a service in SF. 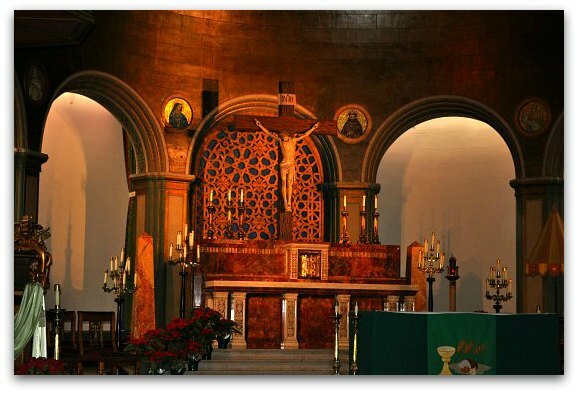 It's also one of the churches in San Francisco that welcomes visitors. The steps of this church are where Joe DiMaggio and Marilyn Monroe took pictures after their wedding at city hall. DiMaggio married his first wife here (since he grew up in this SF neighborhood), but was not allowed to marry for a second time in the church. 11:30 am) to take a closer look. The Perfect Day in Haight Ashbury: Are you fascinated by the events that took place in the 1960s in this epic SF district? If so, then you will enjoy that one day walking tour of The Haight. On this tour, you will hike to the highest point in the district, walk past the places where famous musicians lived during that time and sample goodies from some of my favorite bars and restaurants. Waterfront Segway Tour: Do you want to try something just a little different? How about trying this fun Segway Tour. On this page, you will learn more about my experience on this tour. It includes information on the places we saw, what it was like to cruise around the city on a Segway and pictures from our photo stops along the way. The Perfect Day in Golden Gate Park: Exploring Golden Gate Park is something I often do. This gorgeous 1,000+ acre park features several fun attractions and activities. This itinerary is how I would go about visiting the park if I had just one day. It includes visits to the California Academy of Sciences, the Botanical Gardens and even a stop in the Japanese Tea Garden. Visit the Mission Murals: One of the unique things about San Francisco is that it has almost 1,000 street murals. You will find these colorful displays throughout the city. However, the largest concentration (at least 200 to 300 of them) are in the Mission District. On this page, you will see pictures and get a maps on where you can find them on your own.